How to Root or Flash Custom ROMs or Firmware on Samsung devices using ODIN. HomeAndroidHow to Root or Flash Custom ROMs or Firmware on Samsung devices using ODIN. In this guide we will let you know the best and easiest way to Root or Flash a Custom ROM on your Samsung device using the most renowned ODIN Tool. Odin tool can be downloaded from here. There are dozens of ODIN versions currently available. But the latest version is ODIN 3.12.7 and it is available for download on Windows PC. You can install JOdin3 tool for the Mac OS X too. Most of the Samsung Galaxy smartphone users use ODIN mainly to reinstall Stock Firmware on their devices. If you have Rooted your device or have any 3rd party custom ROM installed on your device. Then with the help of ODIN you can flash the Stock Firmware files on to your device. But Before using the this tool for flashing or Rooting your device. There are some important steps you should follow to do it properly. Make sure to get the latest ODIN version and install it on your PC or Mac. Current Latest ODIN is v3.12.7 as of [November 2017]. You can download it here. When you decided to Flash or Root your Samsung device using the ODIN Tool, the most important things that you should consider here are. 1- Your device Battery Percentage is above 50%. ( For some Low end or Mid Range devices, at-least 70% battery is recommended. The Flashing or Rooting process on these devices can take longer. So better battery backup is necessary. 2- Now check out the firmware files, or Root files. Make sure that the firmware file you have is actually for the same mobilephone that you want to Flash or Root. If you don’t know about your Mobile Model number or Make. You can simply go to Settings > About Phone > Model Number or on Older device Settings > About Device and look for Model or Build number to know about the device. 3- If you have the Firmware files of matched with your device then you can carry on. 4- Once every thing is checked. It’s time to backup your data stored on this Galaxy device. If you have newer Samsung device with Samsung Experience 8 or higher installed, then you might already have important Messages, Call Logs and Contacts have synchronized with Samsung servers. So you don’t need to backup again. In other case you can have these backed up manually using any app you want. 5- For other or older devices you should Backup your Messages, Call Logs, Contacts or media manually using the third party apps available for backup. 6- Make sure to use the Original Data Cable, for connecting your device with PC or Mac. Because using a low quality or ordinary cable might interrupt the flashing process, and this may end up bricking your smartphone. 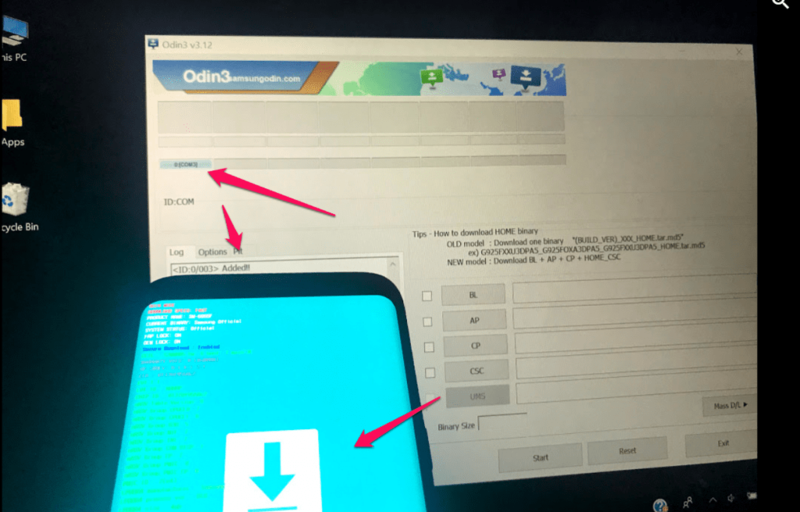 Once you have downloaded the ODIN Tool on your device, All you have to do is open it and connect your Samsung device with it and follow these steps given below. Step 1: First of all make sure to Boot your device into Download mode. Press the Volume Down + Home Key + Power Button all together to reset it into Download Mode, or simply read this Guide. Step 2: Once done Open the Odin3 *.exe file on your PC. It looks like the image shown below. Step 3: Now that you have Booted your device in Download Mode, connect your device with PC while the ODIN is on. Once done you can see the Blue tab Light up showing the 0:[COM3] and in the Log you can see device added info. Step 4: Once done Now you can get the firmware files and add it accordingly. Select BL tab and select the BL file in it. Select AP tab and select the PDA or AP file in it. Select CSC tab and select HOME_CSC file in it. As shown in the image below. Step 5: Once done simply click on Start as seen in the image above. It will take some time in most cases 5-10 minutes and your Samsung device will be flashed with a whole new ROM or the older Stock ROM, which ever you have choose to be installed on your device. The Green tab will show when the whole process has completed successfully. In other case if there is any issue a Blue Tab will show up. The above process can be repeated for Rooting a Samsung device too. Some root packages come with Odin installation while others can be flashed using the recovery mode. You can check for Latest Custom ROMS or Root Guides in How To’s category on our site. Hope you have found this guide helpful. If you have any questions, you can simply comment below.